Disaster recovery and long term retention (LTR) of data can be challenging for mid-sized organizations. Keeping a secondary site up for disaster recovery can be expensive and dealing with tape for LTR can be slow and costly. 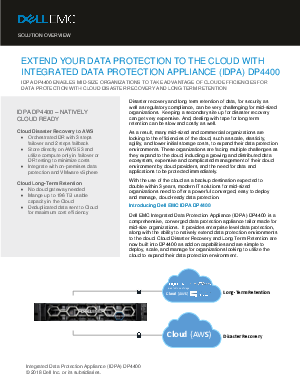 IDPA DD4400 enables mid-size organizations to take advantage of clould efficiencies for data protection with cloud disaster recovery and long term retention. Download this summary from Dell and Intel® to learn more.